Rick Bjorlund and Kevin promise to once again put on a garden party that you don't want to miss. Rick and Kevin are hosting another free Coffee in the Garden Party at their home in Allied Gardens. The garden has large planters, including three new ones, which include a large collection of mesembs, Haworthia, Gasteria, miniature Agave, and other succulents on the smaller side. One planter is dedicated to cacti. 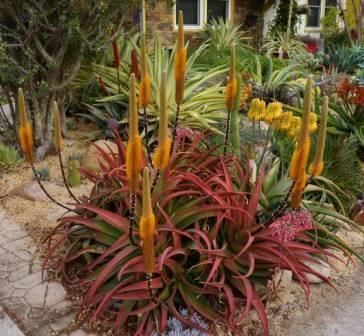 As always, January promises to be a peak aloe bloom time and, with newer varieties blooming each year, Rick and Kevin say they eagerly anticipate the new year as a child might wait for a beloved holiday to arrive. 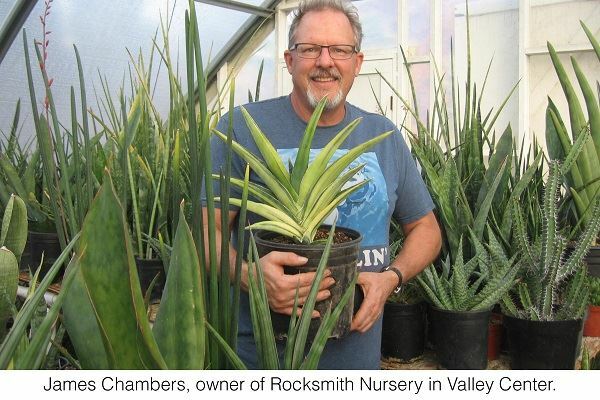 James Chambers, owner of Rocksmith Nursery in Valley Center, will be at the Garden Party. He has been an avid plant grower for over twenty-five years and has specialized in growing Sansevieria, Aloe, Agave, and other rare succulents. Rocksmith Nursery currently has a large assortment of rare and unusual varieties of Sansevieria ranging in origin from South Africa to Ethiopia. Rocksmith Nursery focuses on many Sansevieria species that are rarely or never seen in cultivation. A diverse display of Sansevieria and other succulents will be offered for sale (cash only), and James will give two talks about them at the event. The event time frame has been expanded to allow for mesembs to join the party this year, as they tend to start blooming around 1–2 PM. We will have baked goods and appetizers as well as beverages available. Some of our propagated plants will be available for sale along with landscape sized cuttings/divisions. There will also be a large number of artistic and commercial pots for sale, as well as some garden-related items that need a new home. Please bring cash for shopping.